First of all, I know the title is messed up but so is all of Belichick’s cheating and the new allegations of cheating. But that was neither here nor there in regards to the Chargers’ disgusting loss to the Patriots; with everyone’s eyes on them there is no way the Patriots did any sort of cheating tonight. They just beat the tar out of the San Diego Chargers. QB Philip Rivers finally had an absolutely terrible game throwing 2 interceptions in the first half. 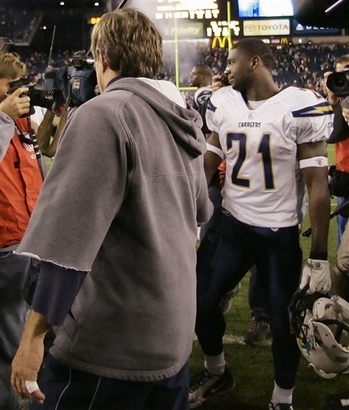 Rivers’ second interception was returned for a TD by Adalius Thomas and that basically put the game out of reach even before the Patriots could secretly record the Chargers in their locker room at half time (yeah, you did just read that). Rivers finished the game 19 of 30 for 179 yards for 2 TD’s and 2 Int’s. He was also scked 3 times. For the second week in a row RB LaDainian Tomlinson was unable to get anything going on the ground; the Patriots kept him bottled up just as the Bears did. He finished with just 43 yards on 18 carries and 15 yards on 4 catches. TE Antonio Gates had a decent night catching 7 balls for 77 yards and 1 TD. 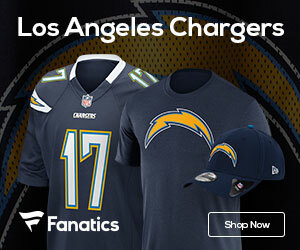 Aside from Rivers literally throwing the game away in the first half, the most disturbing part of the Chargers’ loss was the play of their secondary. There was no doubt that the secondary was the weakest part of the defense but it was surprising to see just how weak they were. Patriots QB lit up the San Diego defense for 279 yards while completing 25 of 31 passes for 3 TD’s and 1 Int. LB Shawne Merriman provided the only bright spots on defense as he recorded two sacks and provided a few big hits. DT Jamal Williams suffered an injury to his left arm and was hampered by that and that contributed to the defenses inability to stop the New England offense. All in all, this is a devastating loss to San Diego fans. Such high hopes have now reached extremely deep lows. Check back later this week for some reasons why not too panic…I know it sounds nuts but the Chargers did do some things that indicate they can be atop the AFC when it’s all said and done.